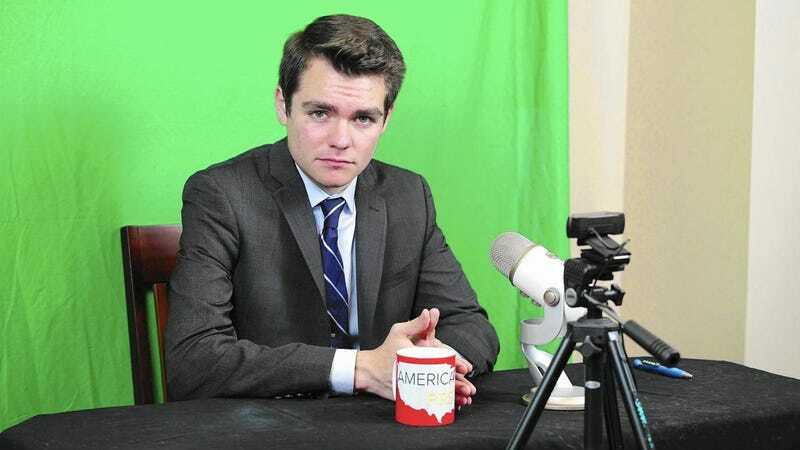 Nicholas Fuentes is now a former student of Boston University just a week after attending the “alt-right” rally in Charlottesville, Va. Fuentes says that threats and harassment caused him to transfer to Auburn University in Alabama, where his Southern pride and love of cement statues will probably be embraced. But never mind the fact that the 19-year-old Fuentes looks like a 38-year-old grown man; he may also be a liar. In an interview with The Plainsman student newspaper, Fuentes said he enrolled in Auburn in May. “It’s just a matter of getting over there,” he said. But according to Al.com, Auburn University is like, “We don’t know him,” and said there is no record that the student has enrolled. But the Chicago native has high hopes for his stay at Auburn. Fuentes made waves at Boston University last year when he donned his “Make America Great Again” hat and posted YouTube videos in support of Donald Trump. His America First video series is hosted on the Auburn-based Right Side Network. I guess he’s never seen all of the international or black students on campus. This should go over very well.